I am not a designer. I have no training in design. Nor do I have the various software packages that enable modern designers to do the things they do. However, like every other schmuck on the planet, I think I’m a designer, or at least think I have talent to be one. The logo for Magnet Communications. Designers are a different breed, though. And as a communications professional and content creator who has worked with a wide variety of designers over the years, I have developed a good understanding of how to work with and get the best from them. I have managed the design and production of everything from corporate logos and identity to online ads and websites. And given the importance of creating content in today’s marketing landscape, working effectively with designers has taken on an even greater significance. Typically, I am both the writer and the liaison between the client and designer in these relationships. I work with the client, internal or external, to develop a creative brief, which is a document that details the scope, direction, and needs of a specific project. For example, when a client asks for a brochure, or I recommend that the client develop a brochure, I am responsible for articulating the purpose of that brochure, what exactly it is intended to accomplish. In other words, what success will look like. I am also responsible for identifying the target audience, specifically who we hope will read the brochure, along with what action we hope they will take as a result of doing that. To that end, it is essential for the client and me to have a thorough understanding of that target audience, from the basic demographic information to emotional and cultural traits that should be taken into consideration. In fact, it is just as important as understanding the client’s identity and goals, because the designer must consider not only how to represent those on the client’s behalf but also how to do so in a way that resonates with the target audience. And, as we progress with the development of the design, we must view and critique it through the eyes of that target audience. In addition, I need to know how the brochure will be produced and distributed, which are factors the designer will have to take into consideration as well. And all of this must be done upfront, so that we don’t end up working our way towards a concept that doesn’t achieve our goals. 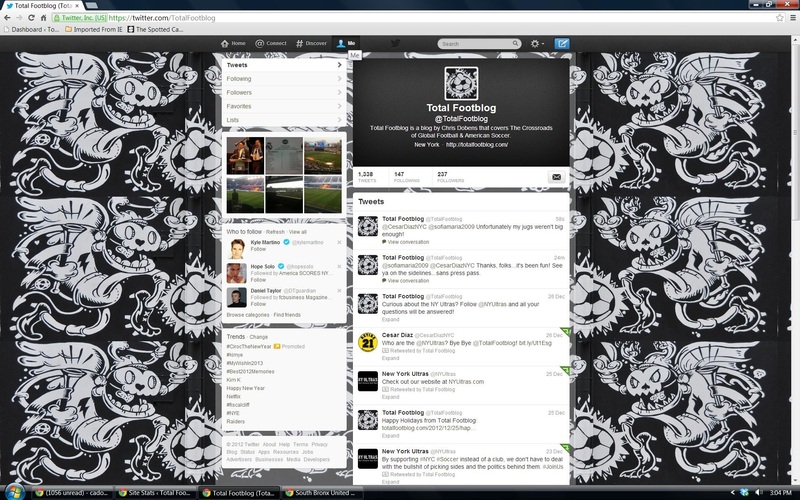 The Twitter feed for Total Footblog. That is why the creative brief is so important, because not only does it convey all this critical information to the designer, but it also – by virtue of putting it down in writing – forces the client to articulate their vision of what the design should achieve, what the project needs to accomplish. In effect, it gives us something to work towards, and to measure our success by. I am also responsible for working with the client and designer to develop a schedule and budget for the project. Though, all too often, that budget and schedule are already set by the client’s needs, so it’s more a question of how the designer and I can best achieve the goal within those fixed limitations. And the latter is an important point to communicate to designers, especially those fresh out of school, where deadlines and other parameters tend to be far more reasonable than those typically encountered in the real world. Because, in the real world, you don’t create the best design, the best brochure; instead, you have to create the best that can be achieved within that budget and time frame. I like to bring designers into the project as early as possible. For many, it’s helpful for them to gain a firsthand understanding of the client’s business, needs, and limitations. It also gives them a greater sense of involvement and belonging. And it allows them to ask questions, which can often lead to discussions that prove beneficial to all involved. Unfortunately, most clients don’t know how to communicate with designers. They use words like clean, busy, and elegant. Such terms tend to be relative, though, depending on one’s individual perspective and experience. I have also received direction with words like traditional, creative, flair, and dynamic – again, all of which may have slightly different meanings to everyone in the room. That is why, even though I am a writer, I find that it is helpful to include examples along with the words I use when I am giving creative direction to designers. For example, if I think a particular color or color scheme will work well, I will include examples of that specific shade rather than simply describing it as light green. Similarly, if I see a typeface or layout that I think resonates with what the client is looking for, I will include that too – whether it’s something I saw in a magazine or a screenshot (or, better yet, a URL) of something I saw online. For one project, in which we were working to redesign a specific piece of collateral, I included examples of items that had the look and feel of what I was trying to achieve. And I went on to explain specifically what I liked about those items, the attributes that I thought would be useful to the design I was seeking, along with how I responded to those attributes. Because, in working with designers, I have begun to understand the way they think. They don’t randomly pick colors and shapes, slapping a line here or there because they think it looks nice. Every element they include is done intentionally, with purpose, trying to evoke a specific response from those who view it. So developing an understanding of how and why they design things is invaluable, just as it is important to encourage designers to understand the client’s needs and goals, the target audience, how it will be distributed and used, so they can factor all of that into their design. Once you have presented the creative brief, agreed on a budget and schedule, and answered any questions that may arise, it’s important to step back and give the designer the time and space to do their thing. Every designer is different, but I have yet to meet one who likes to work with people standing over their shoulder. That’s not to say you shouldn’t check in periodically, to make sure everything is on track, and to answer any questions or concerns they may have. But try not to hover. And if you really want to advance the cause, I have found it helpful to bring them sugar, caffeine, or whatever treats help fuel their creative process. A happy designer is a productive designer! When it comes time for providing feedback, the words you choose are just as important as when you were conveying the direction in the creative brief. For example, if you ask the designer to make it greener, which sounds easy enough to do, consider that there is no way for them to know where exactly greener falls on the scale of greenness. I have also had clients that say things like it lacks the wow factor, which could leave one wondering if they’re talking about the wow factor of a unicorn on a unicycle or the wow factor of the first time you powered up an iPhone. There are many reasons to be wowed, from novelty to functionality, so you really need to be more specific. And perhaps my favorite feedback was it’s too horsey, which was used to describe a catalog cover we proposed. And I assure you, there were no large, solid-hoofed, herbivorous quadrupeds involved in that design. The point is that you should try your best to articulate specifically what you do not like about the design. Otherwise, the designer and I are forced to try and guess, and that doesn’t help anyone. If it involves the colors, try and find a shade of green that you think will look better. Either identify it on the RGB or CMYK scale, or bring us something that has the particular shade you are looking for. If it’s the layout that concerns you, where items are arranged in the design, then specify that. Or if it’s the typeface, the font or size of the text, then address that. And if you are struggling to identify something specific, then give some thought to why you feel the design doesn’t meet your expectations, and then articulate that. If you can’t define the problem, we can’t fix it. Also, it’s equally important to identify specifically what you do like about the design, so that these attributes don’t get abandoned in subsequent revisions. Be sure to listen to your designers, as well. They can offer valuable insight. For example, if I were the CEO of McDonald’s, I would have fired the designers who suggested the horrendous color schemes you find in their restaurants. However, those colors were chosen for a reason, with research suggesting that they combine to encourage people to eat more food. So before you rush to judgement, ask the designer about the colors, typeface, layout, and artwork they have recommended. It may be specific to something mentioned in the creative brief, something they learned about the target audience, or even something as simple as basic readability. In the realm of design, so much is subjective. As such, it might be impossible for everyone to completely agree on which design works best in a given situation. The key, as I noted earlier, is to view the design through the eyes of your target audience. It may not necessarily resonate with me or my client, but it has to work in the eyes of the intended audience. Ideally, I like to incorporate a focus group if time and budget allow, so that we can get genuine feedback from the target audience during the design process – perhaps even in selecting the final design chosen. But more often than not, I have to simply approach a customer – or even a friend or colleague in the target demographic – and ask for their input. While this is far from a scientific approach, it might at least help identify any flaws or weaknesses in the design that we may have overlooked. At the end of the day, it’s the client’s decision. That is why the creative brief is so important, in that it can serve as a checklist for what the client hoped the design would accomplish. And that checklist can help them decide which concept to go with. Ultimately there is no right or wrong choice, but rather which one you feel best fulfills the objectives laid out in the creative brief. Clients might be interested to know that, while we will usually present a few options to consider, we typically have a favorite that we like better than the others. That is to say the designer will have a favorite and I may have a favorite. But don’t ask us for our personal preferences unless you are really struggling to decide for yourself and need a tiebreaker. Because the designer’s favorite and my favorite may not be the same one, which could make your final decision all the more difficult. Along those lines, have you ever wondered if we are presenting two weak concepts in hopes of forcing you to choose the third option, the one we really like? Yes, that happens. But I have also seen it backfire, with the client opting for the filler, not the thriller, so I avoid playing those sorts of games. The membership brochure for Asphalt Green. Speaking of games, do we ever lie to you about schedules? Yes. Yes, we do. And you’re welcome for that. Because it’s actually prudent to build in a buffer in the schedule for any unexpected problems that arise, because they always do. And when dealing with clients who have a reputation for failing to clearly articulate what they want, failing to abide by what they said they wanted, or failing to adhere to schedules, it’s essential to factor that into the schedule as well. This is especially true when you are operating in-house, and know the track-record of those involved in the decision-making process. Which reminds me: be sure to agree on who is part of that decision-making process up front, so you can get their input and buy-in on the creative brief before the process begins. Also, when we say that we need your approval on Wednesday, please don’t try to guess what we really mean – what buffer we have factored into the schedule. We may, in fact, not need your approval until Monday, when we are actually scheduled to go live or to print, but a lot can go wrong between Wednesday and Monday. It’s our job to expect the unexpected, so please don’t make it that much more difficult for us by second-guessing our schedule. As content creators, we tend to have a far greater respect for deadlines than most clients do. Not only do we live by them, but when they are missed, we are the ones held responsible. Finally, I have occasionally been asked if I have ever “re-presented” an earlier version of something that the client had already rejected before. Yes, I have. But only once, with a client who I didn’t think was abiding by the creative direction they gave us. I forget the actual numbers, but we were already well into double digits in terms of the number of reworked concepts we had presented, which is ridiculous given the simplicity of the project and the fact that we had already fulfilled the objectives laid out in the creative brief. Clearly there were some office politics involved, and the delay – despite hurting business – was being done to send a message. So, rather than play politics and risk further harm to the business, I decided to go back in with one of the initial versions that the client had rejected early on, one which I felt best fulfilled what was laid out in that creative brief. Not only was it approved this time around, the exact same one that had been summarily rejected weeks before, but the client told me that I finally got what they were looking for. Yeah, I got it all right.